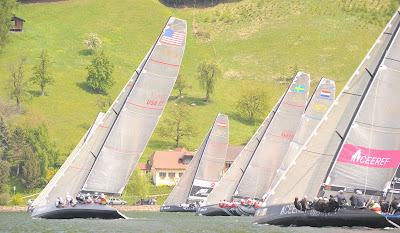 Copyright: GEPA / Ralph Martin Fisher / RC44 Class. Gmunden- Today was the first day of fleet racing here in Austria. After torrential rains last night, the wind was slow to get going but finally around 1400 we got the first race of the day started. As you probably know, the RC 44 is an "owner driver" class in the fleet racing. Our owner, Gennady Timchenko, has not been able to attend any of the three previous regattas onboard Katusha. But he has come to Austria and he was our helmsman today. What is impressive about this is that today was his third day sailing ever. Yesterday, the practice day was the first time he ever steered a boat. The RC 44 is a Ferrari of boats and the fleet is very competitive, so you can imagine what a stressful day it would be for a novice sailor to be steering one of these boats in a 10 boat fleet race. Anyway, Gennady did great today. We didn't finish last in any of the four races and in fact we are in 9th place in the fleet racing after the first day. He had a smile on his face despite receiving plenty of suggestions all day long. The racing on the lake is plenty shifty, so there are always opportunities to come back and there was plenty of mixing out there. Cereef who started off with a last place in the first race ended up winning the 3rd and 4th races. Larry Ellison's BMW Oracle has maintained their top form from the match racing and are leading the fleet racing at this point. Tomorrow's forecast is for more rain and less wind. But things tend to change fast around here, so we will see what we get when we wake up.